Today, Lynne Swanson (Blaze) participated as part of a panel on the Finance Committee’s study of Part 5 of Bill C-31 – the Canada-United States Enhanced Tax Information Exchange Agreement Implementation Act (or, as I call it, the Canada-United States Abrogation of Canadian Rights Agreement’. 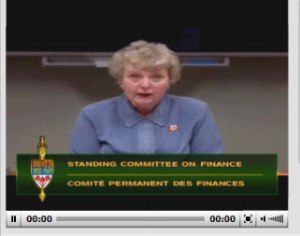 Essentially, Lynne was invited to speak about FATCA and the IGA. I, for one, admire her bravery and commitment to our shared cause and her willingness to appear before the committee and not only speak, but answer questions from the committee members. She only had 5 minutes for her opening statement, and then was expected to answer questions from the members of the committee. At the time of this posting, I don’t have a full report on exactly what was said and asked. We will provide that as soon as we can. What I do have is the speech Lynne prepared in advance. I most sincerely hope that her very eloquent statement fell on receptive ears. I come before you as the voice of one million Canadians. We are Canadians. Many have been Canadian citizens for life or for decades. We chose Canada. We expect Canada to choose us and our rights over foreign bully demands. “Why do our most heinous criminals have more Charter rights than I do,” asks a Nova Scotia police officer of 33 years. He was born in Maine almost six decades ago because his New Brunswick mother was sent there to give birth. A Quebec woman who has been a Canadian citizen since birth says her ancestor who came to Canada in 1682 must be turning over in his grave at FATCA. An Ontario First Nations husband and father is horrified his Canadian government will help United States seize his family’s financial records because his Native Canadian wife was born there. An Alberta woman reports her mother who upheld Canadian laws for many years as Justice of the Peace is now medically and physically too frail to deal with FATCA stresses. They and one million other Canadians were betrayed by FATCA Intergovernmental Agreement. We were offended and insulted to hear Minister of State for Finance call us “American citizens abiding here in Canada” in the House of Commons. If Canada mandated financial institutions to seek Canadians born in China, India, Iran or Eritrea for CRA to transmit private financial information to those nations, there would be outrage. Canadians born in United States should have the same rights as all other Canadians. Canada should strongly defend those rights and not sacrifice them to a foreign country. Those statements hold true now. Under threat of economic sanctions and penalties, Canada surrendered its sovereignty to a foreign power with the IGA. Canadians expect Parliament to speak for Canada. Canadians expect Parliament to uphold Canada’s laws, rights and constitution. Anything less is an affront and betrayal to Canada and to Canadians. I implore you. Do the right thing. Stand up for Canada and for all Canadians. If I had my way this would be the start of very public civil disobedience and a rabid anti American campaign aimed at tourists coming to Canada in order to force businesses here that are benefiting from inviting this poisonous plague into this country for profit into complaining to the govt regarding the shabby treatment. Let Canada Tourism go to the Govt and complain that the Canadian economy is being damaged due to 1 million or more Canadians and their friends making tourists miserable. If anyone here can tell me why this isn’t a great idea then go for it. If American tourists complain about rude treatment then tell them to take it up with their leader Stephan Harper as he is the dog responsible for the new anti US attitudes. Point being if we don’t have the same rights as other Canadians then we will attack Tourism thereby creating pain for the Government. I just made a comment on the Financial Post article – my Disqus name is Gordie N Ott (as in Gordian Knot). FATCA is like the Gordian Knot, and I believe we are well on the way to cutting/untying it, thanks to the relentless efforts of Brockers/Sandboxers. The post is not much, I just don’t seem to have the energy most of you regulars do. Way ahead of you. I’ve already up arrowed it. It was direct, clear and compelling. Couldn’t ask for more. Thank you. I admire your creativity, Chears. Chears: Well at least you are still here with us. Regarding MP Allen: ” Congress has spoken”: Lynne’s answer was perfect. We need Canada to tell US ‘Parliament has spoken’! Regarding Con MP Allen’s reply that they were told that by a US Treasury spokeswoman, and he was appalled by the comment. He should have been because US Treasury was in no way telling the truth about Congress speaking , because they have not. The Dem congress and senate did pass the HIRE ACT in which FATCA was hidden, but NO authority was given whatsoever for Treasury to negotiate IGAs with ANY country. They are a work around , forcing countries accept what is illegal and unacceptable totally. Without IGAs FATCA falls , fails and is DEAD. US reciprocity for one will NEVER be given. Two states are in court RIGHT now to prevent reciprocity anywhere ever. MP Allen and the rest of the Conservative government seem to be so intimidated by anybody in Washington they failed miserably to do the job they are mandated to do: Protect and Defend Canada and Canadians. Not to mention IGAs are designed to be a privacy , Charter and Constitution override. So, says Treasury. We have a gun here called FATCA. We insist you load this gun with a hollow point bullet called an IGa, aim it at your head and FIRE! And our Canadian government said, ‘OK, and fired. US authorities look on in horror and say to themselves “why did they commit suicide?” Help is on the way! LOL except that it is just too true. What a video. Thank you so much Lynn Swanson and all those at IBS so passionately working towards maintaining Canadian rights. I need to listen to this again, and to get a copy of the transcript, but how wonderful it was to see your presentation, as well as Prof.s Christians and Cockfield. The Conservatives may forge ahead despite the education they were offered – now even more WILLFULLY abrogating the Charter, Constitution, the democratic process, and the best interests of the assets of Canadian citizens, voters, taxpayers, accountholders, families and individuals, but they do so having been warned. The video record is very valuable in that respect – it shows the constituents of those Conservatives just exactly how they acted and responded and what they said. Should be of especial interest in Chatham Kent Leamington (and Pelee Island) riding ( http://blogs.windsorstar.com/2013/09/30/pelee-island-eastern-lakeshore-join-chatham-kent-leamington-riding/ ) – where no doubt as a border community there will be many with US indicia or US ties who wake up on Canada’s Birth Day to find their Charter and Constitutional rights were abrogated under the FATCA IGA. Pelee Island is the most southern point in all of Canada. When Chatham Kent constituents contact their MP, will Van Kesteren address them as Canadians, or as “US citizens residing in Canada”? Does he think of his Dutch immigrant parents ( http://www.davevankesteren.ca/about/ ) as “Dutch citizens residing in Canada” ? I’m only half way through the video with John Richardson and have made a couple of observations. I don’t know why Hannah’s being asked anything about how this affects Canadians. First of all he’s dismissed us as being “insignificant”, and suggests we hide if we can, or if we can’t, oh well, you should have known. On the other hand, I can’t begrudge CBA for advocating as they have for an IGA, as the IGA clearly puts them in a better position than without it if you believe that the US would really start withholding. When it was clear that the US wasn’t going to budge, that was the end of any feigned concerns for how this was going to affect their customers, non-US or US alike. This might be expected from the banks, but what is glaring to me is how the government sought only to appease the banks concerns and none of the citizens the IGA would effect. The Conservatives come across as being insensitive and ill-informed (ignorant) for the most part, IMO. It’s clear the banks don’t like us – they like our money, but government’s are expected to at least show some concern for the people who put them there. Adding insult to injury, they say they fought hard for concessions for us too – which we know is a load. @BB: “Feigned concerns” from banks about how this was affecting their customers? I don’t recall ever seeing “concern“ from the banks about how it would affect their customers. Right from the beginning, their concern was about the administrative and financial burden to them and the risks to them in breaking Canadian laws. Their solution? Change the laws. Which is exactly what the Cons are trying to do. The 286 pages I received through Access to Information from Finance was very clear. Their priority was always the financial institutions. No “concern“ was shown for Canadians or for Canadian laws. In fact, they gave Peter Hogg`s letter to the financial institutions while they were still “considering“ an Access to Information request from Elizabeth May for the letter. https://www.youtube.com/watch?v=dbrKTe6lvJw — Just at the start of Mel Hurtig’s comments (not current), I can relate to what he is saying regarding about media, Canadian think tanks, corporate concentration in the press. Hurtig’s comments also shine a light on why Harper has gutted Stats Can. Canada and the United States are neighbours and have long been the closest of friends. We share a common border and we share many common values. This is especially true in the riding of Tobique-Mactaquac. One of those values is fighting tax evasion. We believe in fair tax systems. Many Canadians, including a number of folks in the riding, have become concerned about the impact of two proposed pieces of American tax legislation, and I share that concern. The first is the Foreign Account Tax Compliance Act, or FATCA. Another issue, this one affecting more directly the large numbers of dual U.S.- Canadian citizens and their relatives living in Canada, is the IRS’s Foreign Bank Account Report (FBAR) filing requirements. While everyone’s tax situation is different, most of these Canadian citizens, many with only distant links to the United States, have little knowledge of their tax reporting obligations to the IRS. These are honest and law-abiding people, including many senior citizens now caught in a nerve-wracking situation. Moreover, because they worked and paid taxes their entire lives, they generally do not owe any taxes in the U.S. in any event. Their only transgression is failing to file the IRS paperwork they were never aware they were required to file. These people are not the targets of a crackdown on tax evasion. These are people who have made innocent errors of omission that deserve to be looked upon with leniency. Faced with the knowledge that they do have an obligation to file U.S. tax returns, they want to do the right thing. But the threat of fines for simply failing to file a return they were unaware they had to file, is a frightening prospect that is causing unnecessary stress and fear among law abiding hardworking dual citizens. We appreciate efforts to combat tax evasion. But FATCA would turn Canadian banks into extensions of the IRS and would raise significant privacy concerns for Canadians. Canada respects the sovereign right of the U.S. to determine its own tax legislation. But quite frankly, people do not flock to Canada to avoid paying taxes. We have existing ways of addressing these issues with the U.S. through our Bilateral Tax Information Exchange Agreement. ” ……….. would like to spend a little time on the enhanced Canada-U.S. tax exchange agreement and cover a number of topics under this. First is a bit of the history of where we are and how we got here, a bit of what FATCA is and what it is not, and what the repercussions would have been if we had just let FATCA happen as opposed to taking the initiative to sign an intergovernmental agreement with the U.S.
June 11th, 2014 / 8:55 p.m. Very early days that was. Flaherty’s flounder was no wise exercise. Even at the time his stumble was an embarrassing sign of the major fail that was brewing. When a senior minister of a government publicizes as a “stand” an ineffective attempt to wangle a diplomatic-channels case through hostile foreign media, that minister has just lain down in the road and said please put your tire tracks up my back. Flaherty was a muddled fool who maybe got tired of being the Conservative tool he had willingly become. Flaherty goes down in history as literal self-roadkill. A Harperite politician his own mortician. O Caca-nada-dada, we bend our knee and flee. Let them hang on their own words. How ignoble of you to take Flaherty’s initial principled stand and call it a flounder. Ignoble? Oooh. Here I was, looking toward a knighthood, if not a solid gold crown. Drat. Well, not really. All statism stinks. Can’t help noticing how you went straight for the name-calling. That’s so rational. Wrapped up in that verbal nacre was a real argument cast your way. If you don’t like flounder, try red herring? Pretty clear that Flaherty went flauntily fishing up the wrong creek.